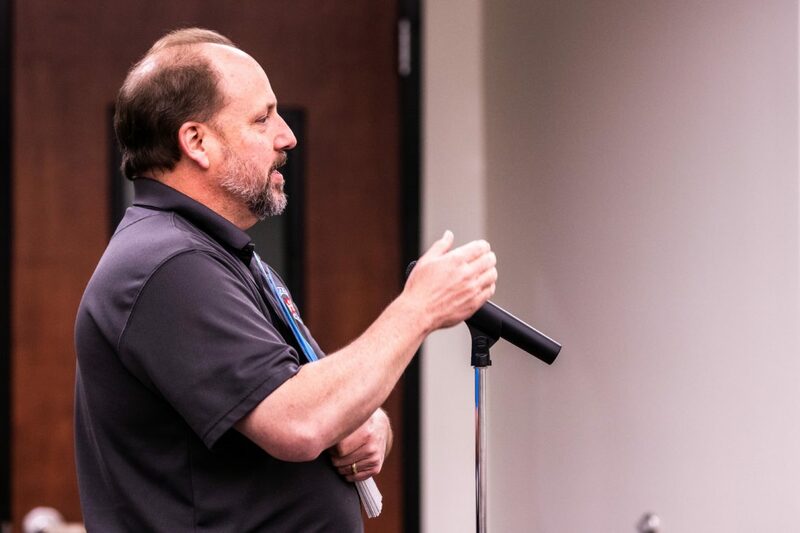 Ingham County 911 Central Dispatch systems manager Bruce Gaukel speaks during the public comment section of the Delhi Township Board of Trustees meeting Oct. 16. Gaukel was speaking in favor of the 911 surcharge increase on the ballot for the Nov. 6 election. Ingham County voters will decide in the Nov. 6 election whether to increase a fee on phone bills from 42 cents per month to $1.80 to pay for 911 services. The $1.38 per month increase would go toward moving local public safety agencies to the state Michigan Public Safety Communication System radio system, said Bruce Gaukel, Ingham County 911 Central Dispatch systems manager. Gaukel presented information about the proposal to the Delhi Township board Oct. 16. The radio system allows for interoperability between users in Ingham County, as well as with 69 other counties in Michigan, Ingham County Lt. Eric Jungel said. This inter-county communication isn’t possible with the current infrastructure in Ingham County, which will not be supported after 2021. The 911 surcharge is paid by all landline, wireless and Voice over Internet Protocol service users in the county. If approved, the increase would become effective July 2019 and would raise $3.7 million annually. The cost of the new system, including the cost of replacing radios currently in use is $30 million. The Ingham County Board of Commissioners could choose to lower the surcharge below $1.80. Gaukel said the surcharge will likely be adjusted down once the system is mostly paid for. Gaukel said that one thing that the county commissioners had looked at in writing the proposal was weighing a property tax millage increase against a surcharge increase. “(The commissioners) felt that going for a higher surcharge spread that cost out more,” Gaukel said. Hundreds of people will be at work Tuesday across Delta Township and Eaton County to run the election. Their work includes issuing ballots to registered voters, monitoring the voting equipment, explaining how to mark the ballot or use the voting equipment and counting votes.